Surya in bhava-1 = dad U.S. Senator and investment banker, Prescott Sheldon Bush. Dad was a distinguished political financier and power-broker kingmaker (5) Surya-Vrizabha indicates banking. Budha rules 2-finance + 5-politics. During his decade in the US Senate 1952-1963, Prescott Bush was a staunch defender of the controversially expensive Interstate Highway System proposed by POTUS-34 Interstate Highways 1890-1969 Dwight D. Eisenhower . Tax financing for the road system was hotly contested but eventually the project was approved. For those heavily invested in oil-and-gas transportation, the commercial benefits of the system were immediate. Chandra-Kanya matches with an intuitive, privacy-seeking (Meena) spouse. Chandra-5 matches with a fundraising socialite community activist. The salient advantage of Chandra-5 marriages is that (barring trouble in bhava-11) the marriage is pre-eminently a friendship. A political career, whether appointed or elected, is nearly always a two-person career . 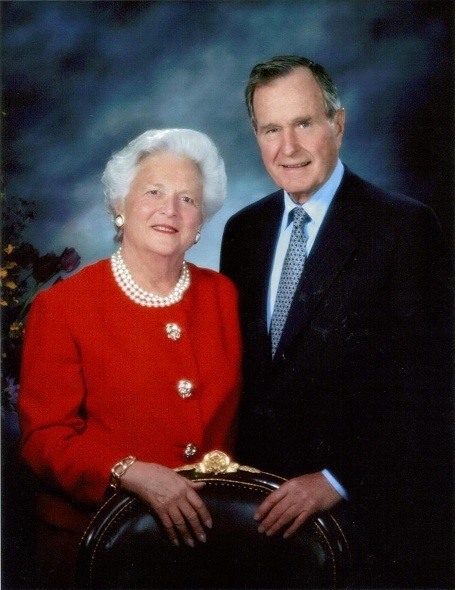 Mr. and Mrs. Bush conducted two-person-career that featured a distinctive division of labor. Mr. Bush's career adventures took him to distant locations such as Washington D.C., New York, Cuba, and China. They spent relatively little time together until moving into the Whitehouse. They complemented and understood each other without overlapping. Also, Mr. Bush's navamsha nodes fall on the Vrischika-Vrishabha axis, so that both of the marriage partners share a psychic connection. 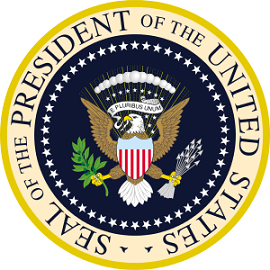 POTUS-41 All the Best 1924-2018 George H.W. Bush (the elder) was a constantly moving person. He was almost never at home during the first two decades of his career. Although he evinced a deep passion for housing, home, and family life (4) nevertheless his work office was usually at least a thousand miles away from the home of his wife and children; sometimes farther. Ketu provides the space. 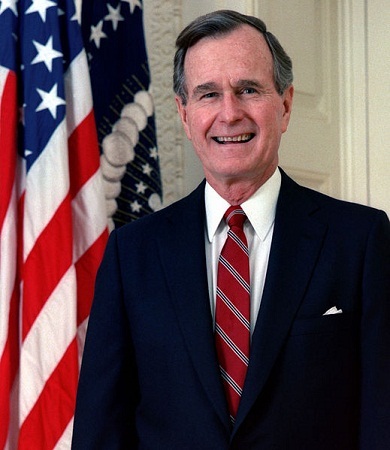 Generally, Bush-41's passions (Rahu-4) arose in matters of patriotism, defense of the land and way-of-life, protection and sustenance of the folkways and borders (4). Following the reign of popular Republican POTUS-40 American Life 1911-2004 Ronald Reagan, Bush seemed to lack charisma. He also lacked a meaningful message. He was in process of losing the 1988 election when a sudden burst of patriotic rhetoric turned the election in his favor. inconsistent in governance Ketu-yuti-Kuja-10 = oriented toward dispersed and unfocused regulatory actions. Although he did as he was told by his handlers, 41 was unable to engage the electorate and lost the 1992 election to Democratic rival POTUS-42 My Life 1946- Bill Clinton. 1943-44 produced a year of flying Navy planes in the Pacific Theatre during WW-2. Budha maraka courts death, but Zukra parivartamsha lagnesha sustains life. His courageous war service became the talking point of his political career. His finances depended on his ability to execute the party directives. Throughout his bureaucratic career, Bush was a fairly successful explainer and process manager who stayed with the central talking points of the political program. During the 1987 POTUS election campaign, he broke from his handlers' leash and wandered off-script, making the legendary "read my lips, no new taxes" campaign promise. Budha rules 2-5 political speech. Budha-Surya-1 receives expansive drishti from optimistic, ebullient Guru-7. The subconsciously driven yoga of inconsistent in governance Mangala-yuti-Ketu-10 casts an infelicitous drishti upon both chatty Budha-1 and sympathetic Chandra. (related also to his hypothyroidism). Zukra-2 family treasuries resides in the emotionally motivated, social-ordering, leadership-seeking; 10th-from-Chandra, suggesting that focus of career would be agreements, alliances, diplomacy, and banking. In parivartamsha with Budha-1 ruler of 2+5, Zukra gains articulation and political engagement. Surya-1 pitrikaraka indicates influence of the father Surya rules 4-diploma. Rahu-Surya following his war service allowed him to graduate from Yale College in 2.5 years with a BA diploma in economics, while also playing university intermural sports and partying in fraternal societies. In a creative interpretation of graduation requirements, the 4-year diploma was conferred after 2.5 years. In which case, although she loves her husband, some misunderstanding will result in a divorce." Her own Soothing Somana-2 suggests the possibility of a husband who is involved in secret affairs. Mr. Bush was the USA director of the Central Intelligence Agency and an undercover operative in Cuba (and other ops). Mrs. Bush lived with distance, raising their children in Texas while Mr Bush worked for 40 years in Washington, New York, and internationally. Even when they lived together (which had not occurred consistently until they entered the Whitehouse), his working style kept her at the dreamy margin (Meena). Her dedication to Seva for hospitals (Meena) was recognized. Her public image during her husband's presidency was framed by her dedication to family life (her Somana-yuti-Guru-2) along with a staunch defense of personal privacy and imagination. Her most famous quote asks: "why should I waste my beautiful mind on things like that?" Barbara Pierce was a society debutante. Her father Marvin Pierce was president of a a noted women's magazine publishing company (McCall's and Redbook) . Accidentally, her father killed her mother in an automobile collision. Surya in bhava-7 + Surya-Vrizabha = a dynamic combination. Karmesha Surya rules 10 and occupies 10th-from-10th. The usual modality of governance authority (10) and entitlement (Surya) = actions of counseling, advising, match-making, deal-brokering. Due to the added impetus of Budha-7 parivartamsha Zukra-8, these highly effective and influential deal-making capabilities were directed toward secret operations. See 7th-from-Chandra = Zukra-Mithunaya-8 representing the husband and his family's assets. Mrs. Busha was not voluntarily engaged in public life. She preferred not to preach on social practices nor to make political comments. She delivered an example of quiet, family-centered dedication to parenting and spousal support. However, behind the screen (8) of harmony-seeking, detail-smoothing Zukra-Mithunaya-8, she was participating vigorously in governance. It was enriching and it was hidden. Her father was a nationally known business executive and her mother a significant American socialite. Shani rules Anuradha nakshatra. The 4th pada of Anuradha is notorious for doing or saying the wrong thing at the wrong time, i.e. foot-in-mouth syndrome. For example, Mrs. Bush declared her family's multigenerational support for the Planned Parenthood organization (going back to Sen. Prescott Bush and earlier) while speaking with conservative-reactionary Republican fundraisers, and this single faux pas was considered to have effectively cost her husband the Republication POTUS nomination in 1980 (he did get VPOTUS but he wanted POTUS). Ruler of 3-announcements is also Shani in Bhava-12 and Ketu occupies bhava-3, contributing a dreamy lack of awareness of the effect of one's reports and declarations upon the audience. Bhava-3 also becomes the Arudha lagna, which results in her becoming well-known for the spew of unapologetic misstatements, faux pas, and offensive references. Although famed as the absorber and harmonizer of that distinguished family's internal squabbles, the socially and financially privileged Mrs. Bush also occasionally incurred the wrath of the electorate. When asked about her concern for the common people during the impending war in Iraq, she responded, "Why should we hear about body bags and deaths?" she said. "Oh, I mean, it's not relevant. So why should I wastemy beautiful mind on something like that?" Rahu in bhava-9 * privilege via glamorous or unusual doctrine, theory, dharma, worldview; seeks a special, important teacher-preacher role in catechesis, principled discourses of abstract ideas, ideology, philosophy. Opportunistic, ambitious professors and religious teachers.